Officially I’m called Wispile Kasper, but my friends know me as Gibson. This is just my place to hang out. If you’re interested in my thoughts on the world, and the scrapes I get into, do keep popping back – when the muse strikes, the paws will type! 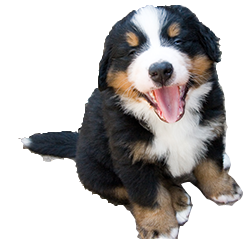 For the uninitiated, I’m a Bernese Mountain Dog, which basically means I’m going to grow. And grow. And grow.